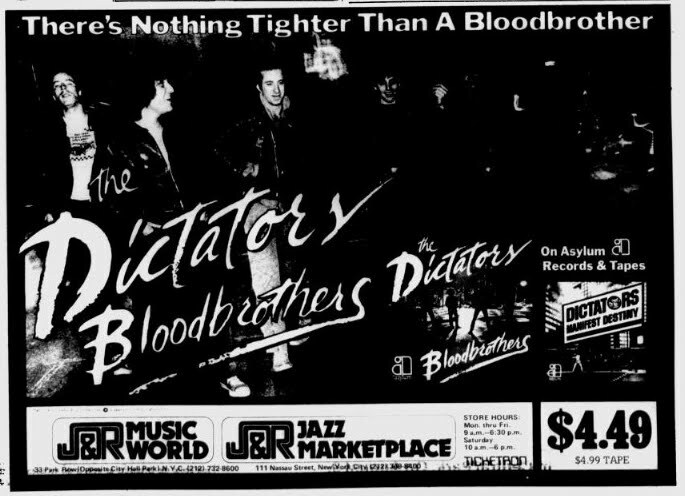 To continue with the 40th anniversary celebration of ‘Bloodbrothers,’ here’s a piece we ran a while back about my first time seeing the Dictators, which was 40 years ago today. Here’s HDM on 10/20/78, again sporting his Mr. Potato-Head shirt. Let’s hope it hit the laundry pile between 9/19 and 10/20. September 19, 1978. A summer of scouring the Phoenix concert listings finally yielded the Holy Grail: The almighty Dictators were going to be making their debut at the Paradise on Sept. 19. Darest I go? I had chickened out earlier in the year, when the band made its Boston debut with a couple of stealth gigs at the Rat, but those were on Mondays and Tuesdays, which were no-gos for a working slob such as myself. No excuses this time — it was a Friday, and I was THERE!! The Paradise at the time was still brand-spanking new, and had the cachet of being Boston’s premier new music venue. What a bummer to get inside, and find out that A. Dancing was not only discouraged but could get you tossed, and 2. The tables and chairs were actually nailed to the floor, so if you didn’t get a chair facing the stage, then you were in for an evening of neck-strain. It didn’t matter to me. These were the Dictators. I would have endured standing on my head if that’s what it took to see them. HDM wasted no time before he was dissing Boston fans and sports teams, proclaiming NYC’s superiority to Bostin in every category. Thank God the gig wasn’t two weeks later, after the Bucky Bleepin’ Dent debacle at Fenway, or else we would have never heard the end of it. Manitoba also displayed excellent sartorial taste, as he sported a homemade T-shirt with a caricature of his head atop Mr. Potato-Head’s body. That was a shirt that they really should have marketed. Another missed opportunity. On With the Show, This Is It!! We open with the TA huddled over his keyboard, arguing with the Producer over his role in the band, and his desire to be a studio-only musician. Producer explains his position, and basically forces TA into being an on-stage performer in the band. TA wanders the stage, struggling to reconcile his ambition with his lack of desire to perform. Heartbroken, he falls into fitful sleep. Opens with the Creation sitting at a lunch counter, being serenaded by Mary-Anne. Scene change — we cut to TA, alone in his bedroom, looking out into the night, lamenting Mary-Anne’s sudden shift in amour. TA argues, again, with the Producer, over his role in the band, while the Creation wanders through with the band hovering around him. TA leaves the stage, probably forever. The Creation now dominates the action. ‘Manifest Destiny’ — Yay or No Way? MM: Manifest Destiny (abbreviated as MD from this point on) is 38:25 of magnificence. SC: I think this album stinks on ice. It’s the Millard Fillmore, the Irlene Mandrell, the Joe Besser of Dictator LPs. MM: This LP had the best vocal mix and showed the widest range for the band . . . sure, the production is “big” arena, and the band kinda gets lost in that. I don’t think the tunes are weak so much as introspective. I actually really love songs like “Heartache” and “Hey Boys,” coming to this band from a hard rock background. I’m not sure if I would have been as big a fan if I had bought GGC first. It was almost too raw for my ears then and took a while to like as much as MD, which I loved from the very first note. MD was also their biggest success sales wise. SC: I also like the 2 tunes you mention, but I can’t listen to most of this album. It’s doubly frustrating to know that the pre-LP demos are better than a lot of the final versions. It could have been so much better. SC: We’re supposed to be arguing here, but I totally agree that a huge part of why I dislike the album is due to its over polished sound. God, the band just sounds soooo bored. OK, so let’s go through this stinker track by track.